Definition at line 279 of file Pool.h. Definition at line 286 of file Pool.h. 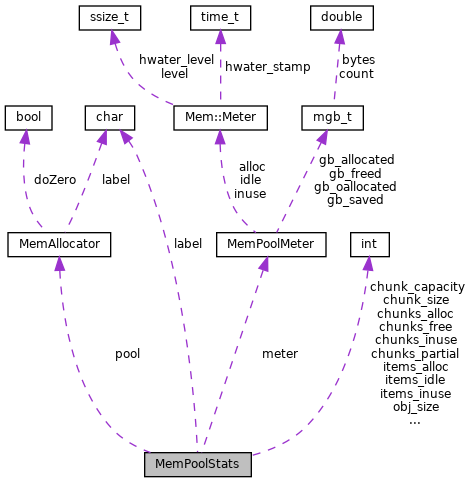 Referenced by MemPoolChunked::getStats(), MemPoolMalloc::getStats(), Mem::PoolReport(), and Mem::Report(). Definition at line 287 of file Pool.h. Definition at line 289 of file Pool.h. Referenced by MemPoolChunked::getStats(), MemPoolMalloc::getStats(), memPoolGetGlobalStats(), Mem::PoolReport(), and Mem::Report(). Definition at line 292 of file Pool.h. Definition at line 290 of file Pool.h. Definition at line 291 of file Pool.h. Definition at line 294 of file Pool.h. Definition at line 296 of file Pool.h. Definition at line 295 of file Pool.h. Definition at line 283 of file Pool.h. Definition at line 284 of file Pool.h. Referenced by MemPoolChunked::getStats(), MemPoolMalloc::getStats(), MemPoolReportSorter(), Mem::PoolReport(), and Mem::Report(). Definition at line 285 of file Pool.h. Definition at line 298 of file Pool.h. Referenced by MemPoolChunked::getStats(), MemPoolMalloc::getStats(), memPoolGetGlobalStats(), and Mem::Report(). Definition at line 282 of file Pool.h. Referenced by MemPoolChunked::getStats(), MemPoolMalloc::getStats(), and Mem::Report().